​Valencia host Barcelona at the Mestalla on Sunday in a La Liga clash in which the visitors will be looking to bounce back from their poor recent domestic form. The champions have not won any of their last three La Liga outings, and a trip to face Valencia this weekend promises to be no easier for Barcelona; though the home side are enduring a difficult start to their own league campaign. ⏰ All over at Wembley! Ernesto Valverde’s side got their season back on track with a thrilling win away to ​Tottenham in the Champions League on Wednesday, whilst Valencia have only won one of their seven league games this season. However, a hard-fought 0-0 draw away to ​Manchester United in the Champions League on Tuesday would have provided a similar boost for Marcelino’s side ahead of hosting the reigning La Liga champions this weekend. Valencia’s league form has been less encouraging of late and has seen the home side drop to 14th in the table, with just one win from their first seven matches of the campaign. The recent 0-0 draw away to Villarreal - in which Marcelino’s side saw Dani Parejo sent off - was followed by another frustrating draw in which Michy Batshuayi’s early opener for Valencia was cancelled out by a late equaliser from Iago Aspas to secure a 1-1 draw with Celta Vigo. Their last two games in all competitions have made for greater encouragement, however, after beating Real Sociedad 1-0 away in their last La Liga outing, Valencia went on to secure an impressive 0-0 draw at Old Trafford in midweek against Jose Mourinho’s struggling Manchester United side. ​Barcelona have endured an even more difficult run in the league, after a 2-2 draw with Girona - in which the Catalan side saw Clement Lenglet sent off - was followed by a shock 2-1 defeat away to Leganes. Munir struck late in the match last weekend to save Valverde’s side from defeat in a narrow 1-1 draw away to Athletic Bilbao as Barca’s stuttering defence of their domestic title continued, before restoring some respite with a captivating 4-2 win at Wembley in midweek in which the Catalans’ quality put Tottenham to the sword. Sunday’s opponents last met in April as Barcelona continued their march towards the league title last season with a 2-1 victory at home to Valencia. The ever-prolific ​Luis Suarez gave the hosts the lead in the first half, an advantage which was doubled by soon-to-be World Cup winning defender Samuel Umtiti in the second half. A late Dani Parejo penalty restored Valencia’s competitiveness in the match but, in truth, was too late to threaten the result as Barcelona went on to secure another three points towards their title triumph. With ​Lionel Messi returning to his typically devastating form against Tottenham on Wednesday night, the Argentine is once again set to take centre stage as the obvious danger man for his side this weekend. 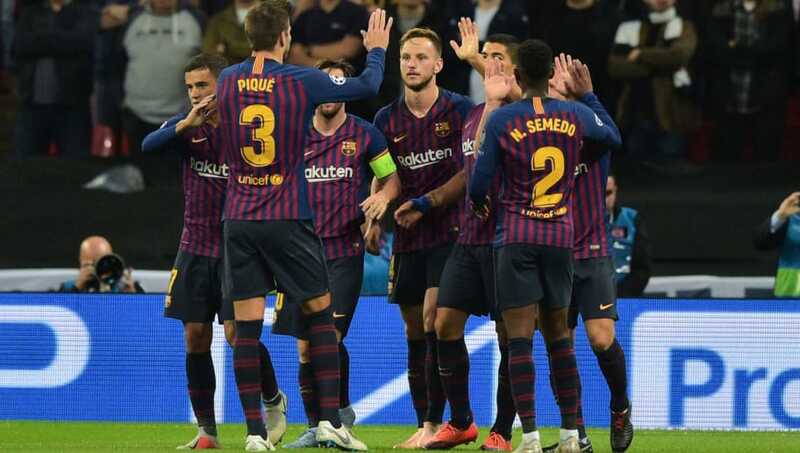 The iconic forward was simply unplayable at times at Wembley in midweek, orchestrating Barca’s 4-2 win over Mauricio Pochettino’s side with a decisive brace. Does anyone really genuinely think there has ever been a better footballer than Lionel Messi? I mean seriously? Messi’s best work on the night was conducted in trademark fashion, cutting inside from the right flank onto his wonderous left foot and pulling the strings for his side. On Sunday, Jose Gaya will be the man primarily responsible for attempting to shackle Barca’s number ten. The left back must seek to track Messi’s movement and block his routes into the heart of Valencia’s rear-guard. One man is rarely enough to stop the Argentine, however, and as the left-sided central defender, Gabriel Paulista must also stand firm against Messi as he drifts inside and looks to drive through the centre of the home side’s defence. Messi often looks to drop deep, too, seeking to gain possession before roaming forward and looking to beat players on the run, and Geoffrey Kondogbia must look to seize on the forward whenever he comes deep to limit his licence to dictate play. The home side have a relatively full squad at their disposal ahead of Sunday’s match, with only Santi Mina side-lined through injury. The 22-year-old forward is suffering with a knee problem and remains the only absentee from selection for Marcelino. Barcelona, meanwhile, are set to be without two key defenders for their match at the Mestalla on Sunday, with centre back Samuel Umtiti still suffering with a knee injury and right back Sergi Roberto continuing to struggle with a muscular problem. ​​Both first choice defenders missed Barcelona’s midweek commitments in Europe as Valverde’s side conceded twice against Tottenham and the visitors will be seeking to tighten up at the back against Valencia on Sunday. Though Valencia have the marginally stronger recent form in La Liga, Barcelona must still be considered favourites this weekend. With Messi having rediscovered his imperious influence on his side in midweek and those around him also firing, only Barca’s struggling defence is likely to be something of an issue for Valverde’s side this weekend, though the champions’ superior firepower should see them come out on top in what is set to be a testing encounter with Valencia.